HISTORY: The Morey family is an extensive one with deep roots in the village of Chassagne Montrachet. Jean-Marc Morey created his own Domaine in 1981 upon the retirement of his father Albert, who, at that point, divided his estate between his two sons (Jean-Marc and Bernard, his brother). Albert Morey was one of the first in Chassagne to bottle his own wines, beginning that tradition in 1950. Drawing upon the rich experience he obtained while working with his father, Jean-Marc has developed a very personal style that reflects a deep commitment to the concept of "Terroir" and eschews the facility and homogeneity that characterizes many "modern" renditions of Burgundy (both red and white). Neal Rosenthal and consequently his company, Madrose, have had the pleasure of representing the wines of Jean-Marc Morey since the 1994 vintage. COMPSITION OF DOMAINE: Rather than splitting individual vineyard plots in half, the brothers decided to divide the holdings among the different appellations. In that way, the already small holdings were not fragmented further, as is common in Burgundy. Jean-Marc possesses about 8.25 hectares of vineyards spread over the villages of Chassagne, St. Aubin, Santenay, and Beaune. Production is fairly evenly divided between white and red wine. The average age of the vines is over 35 years. Chardonnay yields average around 48 hl/ha; Pinot Noir yields are much lower, frequently coming in between 30 and 40 hl/ha. Jean-Marc does not believe in using the "green harvest" to control crop size, which usually consists of removing the tiny, immature grapes while they are still green. He prefers to control production very early in the season by removing excess buds at the moment before the vine expends its energy producing surplus flowers and clusters. VINEYARDS: From the southern part of his holdings, Morey produces the great red Santenay 1er Cru "Grand Clos Rousseau", the classic Santenay Rouge "Comme Dessus" as well as a small amount of Santenay Blanc "Les Cornières". The bulk of his holdings are in Chassagne which enables him to produce a stunning array of whites that includes separately vinified and bottled wines from the lieu-dits of "Chaumées", "Champs Gains", "Caillerets", and "Chenevottes", along with his village wine; in red, he produces the fine 1er Cru from the "Champs Gains" vineyard. As one turns the corner to St. Aubin, Morey exploits the lovely 1er Cru vineyard of "Charmois" to produce a white of character and great value. Finally, from his beautifully situated plot in Beaune, he presents the elegant and complex red, Beaune 1er Cru "Greves". To further enhance the domaine's offerings, Jean-Marc also collaborates with his in-laws whose holdings in Meursault and Pommard enable him to produce Meursaults from the "Grands Charrons" and "Meix Chaveaux" vineyards and Pommards from the "Levrières" vineyard as well as the 1er Cru "Arvelets". 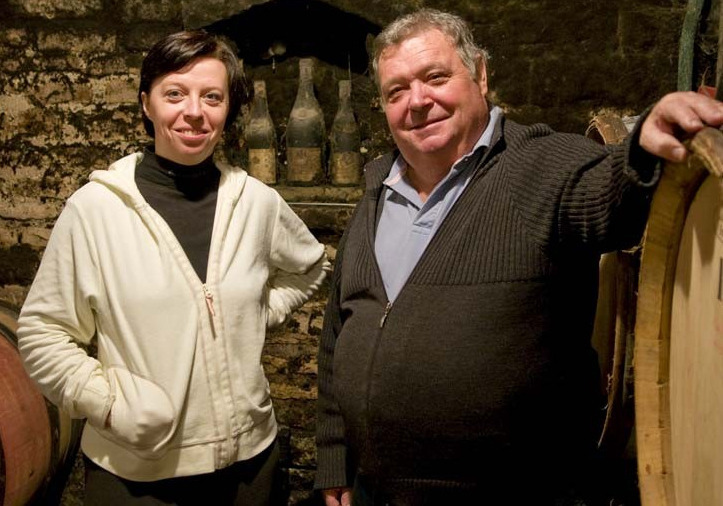 The daughter of Jean-Marc Morey, Caroline, happens to be the wife of Pierre-Yves Colin(-Morey), himself the son of Marc Colin, which add even more wines produces by the different members of the Morey family. In sum, Jean-Marc Morey provides “Rosenthal Wine Merchant” with one of its most impressive and important suppliers in the Cote d'Or with a range of wines that is particularly suited to love affair with "Terroir". METHOD OF VINIFICATION: Jean-Marc Morey favors traditional vinification methods. He uses only wild yeast. For his white wines, the juice goes straight from the press into barrel for fermentation. With the gentler pneumatic press, he does not need to let the must decant to remove excessive particulate matter before fermentation. After fermentation, the wine rests on its lees and benefits from bâtonnage during its aging. His Pinot Noir is destemmed before going into cement tanks for fermentation and maceration. The red wines are also allowed to age on their lees while aging in barrel, adding complexity and roundness to the wine. Only about one quarter new oak is used. For Jean-Marc Morey oak is a necessary part of the "elevage" but it is an element that should never overwhelm the fruit or the "terroir". The wines are bottled the year following their harvest to preserve the freshness and purity of the fruit and to prevent the wood from drying them out and influence texture and structure. CHASSAGNE-MONTRACHET: Rather known for its whites counting for two third of the Appellation’s production, Chassagne-Montrachet also produces delicious reds made out of Pinot Noir, which are produced primarily in the southern part of the commune, in the direction of Santenay; the whites being mainly produced toward the east and the northeast between the communes of Chassagne-Montrachet and Puligny-Montrachet, where the chalky soil contains more limestone than clay, which add more minerality and character to the whites. There are three Grand Cru vineyards within Chassagne-Montrachet, with Montrachet being the most well known, and 50 Premier Cru vineyards. In addition, there are 50 “climats” in Chassagne-Montrachet classified as Premier Cru vineyards, located both to the south of the village, in the Santenay direction, and to the north, in the Puligny-Montrachet direction. Their wines are designated “Chassagne-Montrachet Premier Cru” + the vineyard name, such as “Chassagne-Montrachet Premier Cru Les Champs-Gains”, or may labeled just “Chassagne-Montrachet Premier Cru”, in which case it is possible to blend wine from several Premier Cru vineyards within the AOC. However, in my opinion, the red wines from Chassagne-Montrachet really deserve a bit more attention than most amateurs and connoisseurs are willing to give. A good reason to write a little post about the following one that I recently discovered. Situated in the south of the Côte de Beaune, Chassagne Montrachet is one of the 5 villages of the prestigious «Côte de Blancs». Facing east and southeast, white Premier Cru soils are mainly made of brown clay and limestone. Chassagne Montrachet produces 70 hectares of Premiers Crus. The east-facing “Champs Gains” vineyard lies immediately south of the village of Chassagne-Montrachet, bordering the other 1er Cru “En Cailleret” also known as "Les Caillerets". At an altitude varying from 250 to 350 m, it benefits from exposures ranging from East to South and Southwest. Any wine made from this particular vineyard site, red wines from Pinot Noir and white wines from Chardonnay, may be labeled either as Chassagne-Montrachet Premier Cru, or with the vineyard's own name. “Les Champs Gain”, also spelled “Les Champs-Gains” depending of the producer, is a “climat” 1er Cru of Chassagne-Montrachet, not to be mistaken with the Puligny-Montrachet 1er cru “Champ Gain”. And for the reference, because we are in the middle of the subject, it also exists a 1er Cru of Chassagne called “En Cailleret”, that should neither be mistaken for the 1er Cru of Puligny called “Le Cailleret”. However, to be ever more confusing and as far as I know, the spelling with the “s” at the end or the addition of a pronoun don’t seem to necessarily obey any rules. Producers can write whatever they want on the label, which is quite strange knowing how strict the administration ruling the AOC French system can be. Therefore, do not be surprise if you encounter differences like “Caillerets” or “Cailleret” with or without a pronoun, or even “Champ Gain” or “Les Champs Gain” or “Champs Gains” with or without the pronoun. 2004 Jean-Marc Morey Chassagne Rouge "Champs Gains” has a pale, garnet color with bright red reflects. The expressive nose boasts classic Burgundian Pinot noir aromas of ripe red cherry and fresh red berry intermingled with lovely floral, mineral and earthy notes, with hints underbrush, forest floor and game reflecting of a bit of age (secondary and tertiary aromas). The palate is really good, balanced, earthy, slightly smoky and spicy, with slightly restraint acidity and a good grip of tannins. The expanding mid-palate is very focus, bright and crisp, with flavors of a bowl of fresh mixed red berries, cherry and raspberry, plunging nicely toward the lingering, earthy, slightly mineral finish with underbrush, mushroomy nuances. Overall, an excellent wine, which does not have the ripeness of the 2003 vintage or the complexity of the 2005 vintage or not even the focus and balance and harmony of the 2006 vintage (which is surely one of my favorite of last decade with 2002); yet, it is well crafted and pretty enjoyable. A certain rawness of the components makes me think that this wine didn’t have any fining or filtration. Well, it is not surprising, when you know that Jean-Marc, who is also one of the first to harvest his grapes in September to keep maximum freshness and fruit character, likes to use natural methods and remain a bit old fashioned in his way of making wine and maintaining his cellar. Let’s say, he is one of these traditional winemakers, but for our sake, I hope that he will continue like that, because his wines are rather good compared to many other of his neighbors. In short, you can taste the integrity and the bonhomie of the man in his wines, and those are the signs of a good winemaker reflected in his vines and wines.